If you have been managing search advertising for a while, it can become difficult to keep coming up with original ideas for advert text, especially ideas that nicely fit to varying ad formats and character limits that are in place on the different platforms. Also regular ad testing is an important aspect of any successful PPC campaign, so finding the right blend of headline, message and call to action becomes important. The relevancy between your keyword, advert and landing page all impact Quality Score (i.e how your ad ranks and how much you pay), so the text used on your landing page should be highly considered when writing your first set of adverts for an account. If you are then stuck for fresh advert ideas, make sure you are thoroughly looking over the landing page and website that you will be sending traffic to. Just because you have already used the text from the title of the landing page you are sending traffic to it doesn’t mean there is no other useful text for you to adapt for ad text. Read the entirety of the landing page’s text sections, the businesses ‘About Us’ and other key pages you are not using to get a better idea of the businesses tone and the key benefits they stress across their site. This could be as simple as finding a slightly different way of wording the key benefits you are already promoting. If you closely stick to the terms and text exerts used on the website, it is likely that client or business owner will approve of the adverts, as the text reflects what they have previously approved to go on the website in the first place. It will also positively impact the Quality Score factors as we mentioned earlier, which will help you to achieve better positions in Google’s listings for a lower cost. 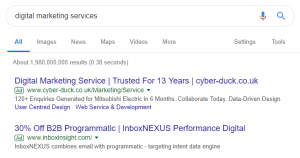 One of Google’s methods for helping you to increase the number of text adverts you are testing is through automatically creating new text advert (and extension) ideas for you. These recommended adverts are generally created for campaigns with fewer than three active ad copies or campaigns where Google believes there is a clear opportunity for an improvement in performance. These new Google generated text advert ideas can be found in the ‘Recommendations’ tab and can be viewed at account, campaign or ad group level. These recommendations can be applied directly to your campaigns from the recommendations tab if you desire. I generally use these advert suggestions as inspiration for new text ideas, which I then incorporate into writing a new advert, combined with either other new text ideas or through borrowing text from my existing text adverts. You may notice Google alerting you to new ad suggestions they have created in the notifications tab. Ad suggestions will automatically apply within your account 14 days after they are created unless you proactively apply, edit or dismiss them beforehand. Find out more about turning off auto applying ad suggestions permanently. 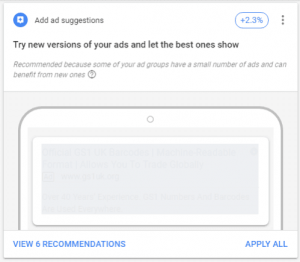 There may not be new text advert suggestions for every campaign, it is dependent on the amount of data you are gaining for each; Google however may include other recommendations for your existing advert structure. An example of this could be Google recommending that you consider testing a responsive search advert if they are not currently being used. If you are stuck when trying to think of new advert messaging, one of the quickest and easiest methods to get some new ideas is to complete a few test searches, using keywords that you intend to target or that are highly related to your product/service, to see what your competitors are writing in their search adverts. This could be likened to playground cliché of spying over a classmate’s shoulder in order to copy their answers, however I would not recommend directly copying Headlines or Descriptions from competitors, but simply considering the USPs or key benefits they are choosing to highlight and deciding if these benefits also could also be relevant to your business, after all if your competitor is using this message it is likely working well for them. Once you have done this you can highlight similar USPs, but with a unique ad copy. If you are completing test searches and there is a limited number of ads being shown, or the ads being shown are not the same type of product/service that you offer, I would also recommend looking at Organic listings. In many cases, the page titles and meta descriptions used have been written by developers, with the intention of being the optimum message they can fit into a similar sized space as a text advert, so can be used for inspiration the same as competitor ads. When looking at different ad copies you are testing or your adverts in relation to competitor’s ads, consider if you were making searches related to the products/services you advertise, which of the key features or benefits the different businesses are advertising would be most important to you as a consumer? Or alternatively, think about what suspicions or reservations a new customer have of a business in your industry? This information can be key to thinking of new text advert ideas that appeal well to searching users. It can be tough to get a true understanding of what elements of your business are most important to your customers, considering that the features that are important to you may not reflect the target market of the business. In this case, you need to listen to what your customers are saying about your business. Speak to your sales reps, read through your own reviews and keep an eye on your social media channels, these are all great sources for getting true insights on how customers feel towards your business, and reasons as to why they hold reservations of initially purchasing or why they are reluctant to do so again. This information can then be used to allay fears that customers may have in the ad text, reassuring customers that your business has considered their thought process and are looking to alleviate key pain points in the customer’s journey. A test that I regularly will consider when thinking of new text ads to trial is: ‘Will users be more receptive to the advert with the brand name included or with more of a focus on the uses/benefits of the product?’. There are a number of reasons why either could be the better performer, so it is important that advertisers are considering how both can be used. Including your brand name can be good for promoting your business name within search engine results, as even users who see your advert (and do not click) will start to learn about your brand’s relation to terms you advertise for. It is important to test adverts that are both brand centric e.g. trademark status, how long you have been established, customer testimonials, endorsements or awards VS non-brand adverts that incorporate more features and benefits of your product or service instead eg delivery, returns, guarantees etc. Of course depending on how big your brand already is in the market will have different effects on click through and how users trust your brand. When bidding on brand terms or targeting existing customers it is highly recommended that ads feature brand name in order to be as relevant as possible. If you need some new text ad ideas it must mean you have already been running ads for a while, therefore we can use the existing data within your campaign to gain insights on how we can do this. First, we can look at the various keywords used in your campaign, which keywords gain the most traffic? If you use long tail keywords, which of them is being triggered most often? This can be a key indicator as to what key terms users are using whilst searching for your products/services, so having these terms reflected in your ad copy can be crucial to creating a good advert that appeals to similar users who are interested in the same products. To take this a step further we can look at the search terms report, as we can see what terms people have used to find your services. Here we can quickly see the actual user searches that have been searched to show your ads and which search terms have had the most impressions, click through (CTR) or conversions. This data can all be helpful in working out what terms people believe to be related to your product/service and therefore could be useful to mention in your ad copy. The ideas discussed above are the core methods I find helpful as places for gaining inspiration or ways to go about thinking of new ideas for text adverts. 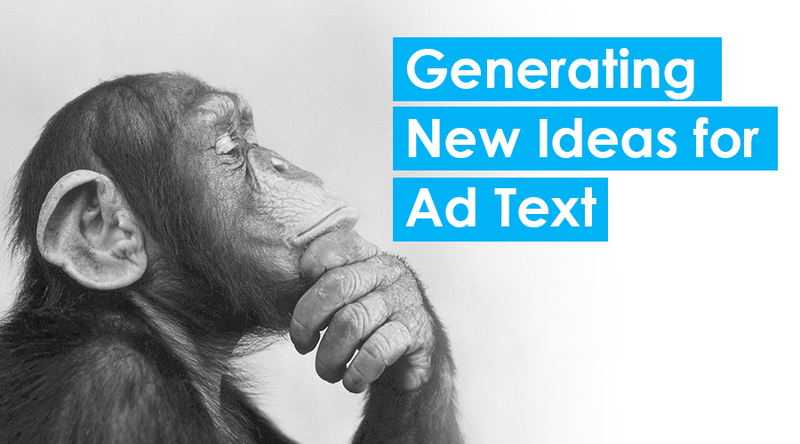 Generating new text advert ideas for testing is so important to any account, as it is impossible for an advertiser to know what single message will work the best. Therefore you must continually be testing new messages and monitoring which performs best, then using this data to inform the creation of new adverts. For more info on how to evaluate which of your Google Ads adverts performs best click here. To find out more about the methods discussed in this blog or to just get some honest advice about PPC advertising please contact us at Anicca Digital.